Brookings Institution Press. Used - Very Good. Former Library book. Great condition for a used book! Minimal wear. Brookings Institution Press. Used - Good. Former Library book. Shows some signs of wear, and may have some markings on the inside. Brookings Inst Pr, 2002-09. Hardcover. Good. Washington, D.C: Brookings Institution Press, 2002. Hard Cover. Very Good/Very Good. Very good copy with minor shelfwear. Dust jacket with minor shelfwear and mild chipping to upper corner and ends of spine. 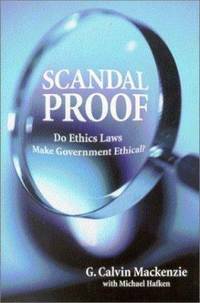 Scandal Proof: Do Ethics Laws Make Government Ethical? Hardback. New. In 1961, President John F. Kennedy signed Executive Order 10930, the first step in a long series of efforts to regulate the ethical behavior of executive branch officials. 2002-08-12. Good. Ships with Tracking Number! INTERNATIONAL WORLDWIDE Shipping available. May not contain Access Codes or Supplements. May be ex-library. Shipping & Handling by region. Buy with confidence, excellent customer service! Brookings Inst Pr, 2002-09-01. Hardcover. Used:Good.